Yesterday evening, Rowena and I went out for supper at Maria Bonita Mexican Restaurant in Beaverton Oregon. Afterward, we returned to Rowena's apartment. That was when I met Anzu, a green cheek conure! Kawena [kahˈ-vee-nah], Rowena's 14-year old daughter gave the bird the name of Anzu which is a girl's name meaning "apricot" in Japanese. After Anzu gave my outstretched finger a few soft bites, she warmed up to me! All the members of the Scampy RV team had a meeting yesterday afternoon. Scampy called the meeting to order. 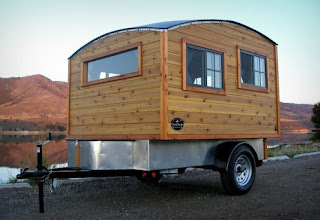 ➜ Raise Scampy's ground clearance so that she may be able to travel forest roads [Oct 2018]. ➜ Repair the collision damage to Señor Tránsito's front-end [Oct 2018]. ➜ Sell Twayler our 2016, 29' Apex Coachman travel trailer [Nov 2018]. ➜ Sell Señor Tránsito [May 2019]. ..... when Scampy And I Cannot Get Along! Perhaps this RV might do? To the tune of Willie Nelson's "On The Road Again." 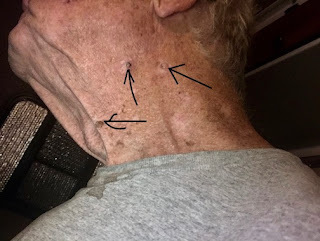 About a month ago, some growths appeared on the left side of my neck. I wondered about them. But did not pay close attention at the time. One day as I drove along in Tránsito, I noticed the Sun shining thru the window to the left of me. I had mounted a polarized dark plastic sheet on the driver's side window because the Sun's heat bothered me. And this plastic sheet did stop the infrared radiation. I no longer was bothered by heat from the Sun. I asked Google what kind of Sun radiation causes cancer? The answer is, Ultraviolet radiation! I gotta get myself to a dermatologist fast!! This afternoon I mounted a heavy white colored poster paper sheet which covers the upper part of the polarized plastic sheet. This will stop my exposure to the Sun's ultraviolet radiation coming thru that window! 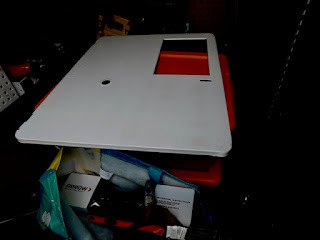 The replacement water heater door that was purchased from Curtis RV here in the City of Beaverton Oregon was ordered to be white in color. And it is white. But not white-white which is the color of Scampy. off-white color still shows thru. One more coat of spray paint should do the trick! It's raining now. So, we will wait until tomorrow for the application of the 2nd coat. Painted heater door drying inside Tránsito's storage area. 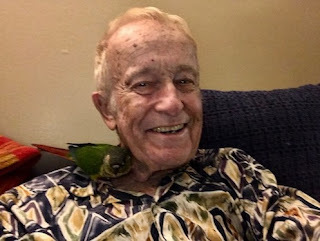 Humm..... do I see a conure in George's future ? Have you owned a bird yourself? A Green Cheek Conure? Yes google is better on Maps but there's also one other thing that may be a benefit for you . If by chance you've never heard of this . Your pioneer radio has Bluetooth your iPhone 7 has Bluetooth. why do you not just pair them. no plug in necessary. On second thought, I believe a Heads Up Display to be a distraction to driving. It may be a much smaller distraction compared to Car Play. But a distraction nevertheless. I have made a deal with myself that I do NOT touch Car Play while I am driving. I had a melanoma removed recently, George. It did look similar to your spots. Many times just simple removal takes care of the issue with no further concerns, other than follow-up exams. Please don't put it off. Thank you sooooo much for urging me. Tomorrow morning I am going to Kaiser Medical in Beaverton Oregon. Assuming you are using Apple Car Play to display the maps on your Pioneer radio if you update to the latest IOS you can use Google Maps instead of the inferior Apple Maps! I updated to iOS 12 yesterday. Google Maps is there on CAR Play! So is the WhatsApp app. Later on, when I went to remove the passcode requirement, my iPhone 7 locked up and would not permit the passcode to be entered!! work-around. I had to use Recovery Mode in order to regain the use of my iPhone!. It may be that somebody at Apple does not care much for iPhone owners who don't like their passcode nonsense!